Spoon quinoa and taco meat on to one side of a pretty bowl. Arrange the rest of the toppings evenly on the other side of the bowl. Post your pretty food creation to Instagram, mix it up, and enjoy! Looking for a rice-free sushi option? Your search ends here. 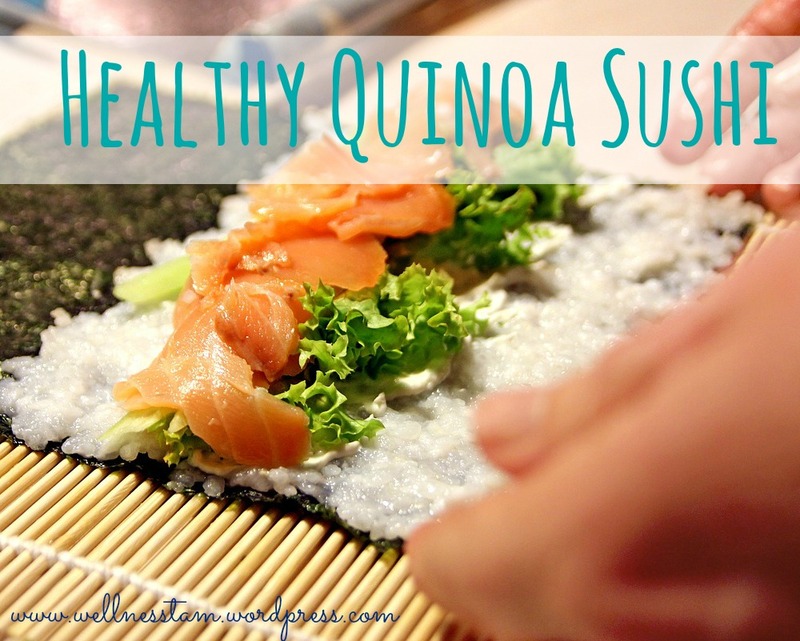 Quinoa sushi is easy, delicious, and jam-packed with protein and nutrients. It also has a lower glycemic load than traditional sushi rice, so you will stay full longer. Swap in sashimi grade tuna or salmon if you have it available to you, otherwise broiled or smoked salmon works great. If this is your first time making sushi, it is very helpful to watch a quick Youtube video on how to properly roll sushi using a bamboo mat, otherwise your rolls may not stay together. Combine quinoa with rice vinegar and mirin in a mixing bowl. If the quinoa was just prepared, allow to cool to room temperature. Place a sheet of nori shiny side down on a bamboo rolling mat (see here). Spread half of the quinoa on the nori, leaving about a 2 inch edge free on the far edge. Arrange salmon and toppings horizontally a little closer than half way on the mat. Roll tightly, and wet the far edge slightly with the rice vinegar/water mixture. Repeat with remaining ingredients to make second roll. Using a very sharp knife (what I use), wet with rice vinegar/water mixture and then slice into 6 to 8 pieces, wetting knife between each cut. Arrange sushi on plate and serve alongside coconut aminos, wasabi, and ginger. This recipe is my all-time favorite. I came up with this last summer when I was commuting to work and needed a quick and healthy breakfast option. I frequently make this on Sundays, and package up individual slices for a delicious breakfast option all week long. It tastes great when served alongside fresh fruit. If you don’t have all of the vegetables available, use whatever you have on hand and I promise it will still turn out great! Preheat oven to 375 F. Toss cubed sweet potato with coconut oil and season with salt and pepper. Roast in oven until cooked through, about 15 minutes. [Alternatively, you can microwave the sweet potato until no longer hard in the center]. Meanwhile, brown the ground pork in a large skillet. Remove, drain, and set aside. Saute the onion and mushrooms in the same skillet until nearly done, and add in the spinach. Stir until just wilted. Remove from heat. In a 9 by 13 pan, lay out the cooked sweet potato evenly. Top with the cooked pork sausage. This will form the “crust” for the egg bake. Layer in the cooked vegetables, and then top with 8 eggs. Add more eggs if needed, to ensure that the vegetables are covered. Bake for 30 minutes, or until the eggs are set. Remove from oven and allow to cool. Cut into 12 large slices, and wrap with plastic wrap or store in an airtight container. These will stay good up to 5 days in the refrigerator. They can also be frozen.